Fox News may have missed Donald Trump. Its viewership was down to 11-13 million viewers, half what they got in the first debate last fall. (The Democrats’ debates have had only eight million viewers, thanks to DNC Chair Debbie Wasserman Schultz’s scheduling them at low viewership times to protect Hillary Clinton.) But, if the eyeballs were down, the substance was up. Trump was absent, but he still hovered over the event like Banquo’s ghost. The non-Trump candidates were feisty. In Cruz’ case, he battled as much with the moderators as with other candidates. The audience didn’t like his whining about the questioners and booed Cruz appropriately. His debate with Marco Rubio over immigration, who had changed positions and when, was spirited and caught both between statements playing to their base and those made when actual legislation was on the Senate floor. It was substantive but a bit inside-the-Beltway, and Chris Christie was probably right when he said we needed a Washington-to-English dictionary to understand the back-and-forth. Absent Trump, Cruz was the mean and nasty one, and the evening didn’t go well for him. One of his calmer moments was when asked, given his fight to repeal Obamacare, what he would replace it with. His (questionable) premise is that the competitive marketplace could work and that he would permit the purchase of insurance across state lines and expand health savings accounts. The moderator failed to ask about pre-existing conditions or allowing young adults to stay on their parents’ policies, and Cruz was mum on these important points. Marco Rubio was like a well-packaged Ken doll, programmed to respond to every question with part of his stump speech. He seems to have only one level of modulation. Christie seems to be channeling Rudy Giuliani from 2008. Though he does get off some good one-liners, everything goes back to his 9/11 experience and ends with his promise to defeat the demonized Hillary Clinton. In Trump’s absence, Jeb Bush had a good evening. Beyond pushing his “proven record as a conservative who can govern,” he was particularly strong on defense issues and on immigration. More than one pundit ascribed his good performance to “not having Trump in his head,” leaving one to speculate on how his being cowed by bully Trump augurs for his standing up to the Vladimir Putins of the world. John Kasich, who in some new polls is now running second in New Hampshire, is also pushing a can-do Presidency and managed to remain positive last night, not showing his tetchy side. It’s his combination of congressional and gubernatorial experience as a pragmatic moderate and his refusal to go negative that helped account for the Boston Globe’s recent endorsement. Rand Paul came across with dignity and a clearer articulation of his conservative/libertarian values, from budget cutting, to foreign engagements, to government intrusion into personal lives. If he were to leave the race now, he could do it with his head held high. Could anyone be more irrelevant than Ben Carson? For his closing statement, he recited the preamble to the U. S. Constitution. I had to learn to recite that as a seventh grader, but it didn’t qualify me to be President. He has plunged in the polls, but probably has achieved his goal of boosting books sales and speaking fees. Forty percent of Iowa Republicans say they might still change their minds about whom to support. So how did first-place Trump’s tantrum and holding a counter event for veterans affect his vote? We’ll know in a couple of days. While the debate was enhanced by his absence, Google reported that a preponderance of the evening’s social media were still focused on the Donald’s fundraiser, which raised about $6 million for the vets from Trump and his friends.) CNN and MSNBC carried parts of the Trump gimmick fundraiser, with a quarter of the Fox audience. CBS streamed it. The question for Trump is: will his supporters show up to the caucuses and vote? Knowledgeable analysts say to watch the turnout. Usually 110,00 to 120,000 Republicans go to the caucuses. If 130,000 show up, they say, it will reflect that Ted Cruz has gotten out the evangelical vote (Evangelicals represent 25 percent of the population but can be as much as 60 percent of the Republican caucus vote.) If turnout reaches 150,000, they say Trump will have turned out enough new participants to make the difference. Just 30 Republican delegates will emerge from the Monday caucuses. To get the nomination, a candidate will need 1236 delegates. And remember, most who win Iowa end up losing the nomination. The fun is just beginning. This entry was posted in Media, Politics, Uncategorized and tagged alternative to Obamacare, Ben Carson, Chris Christie, Fox News debate, Iowa caucuses, Jeb Bush, John Kasich, Marco Rubio on immigration, Rand Paul, Ted Cruz, Trump veterans fundraiser, Trumpless debate. Bookmark the permalink. I really think it is odd that a country as big as ours has political parties and candidates depending so much and spending so much in Iowa and New Hampshire to determine who their candidate is. I think the process has to be changed so that things like corn crops in Iowa don’t affect the future of people in the whole country! Your comments on the debate were right on. 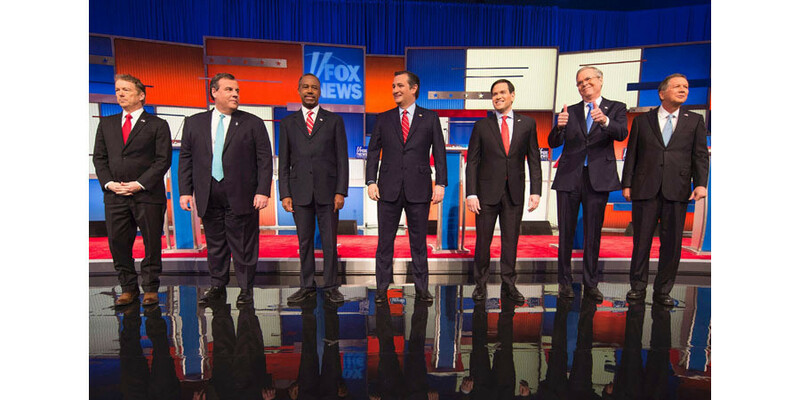 The 2016 presidential election – welcome to the circus. Fine impressions. This is getting interesting.